Drags in places and not always certain of its tone but with a sprinkling of eye-bulging visuals that wink to Spielberg’s heyday. Give it a shot. For his follow -up to breakout hit Rare Exports, Finnish director Jalmari Helander has gone to Hollywood. 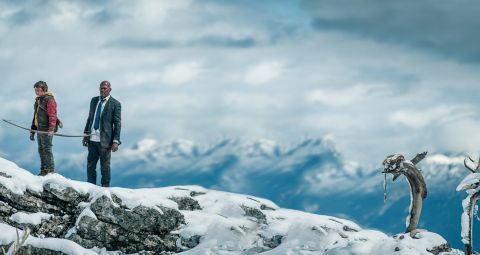 Not literally – Big Game is set in Finland, was largely shot in Germany and is not a studio movie – but certainly for inspiration, its (knowingly) cheesy plot looking to blend the ever-popular save-the-President action movie with the style and awe of an ’80s blockbuster. To mark his 13th birthday, Oskari (Rare Exports’ Onni Tommila) is sent into the forest for 24 hours. He must drop a deer to become a man, only Oskari can barely pull back his bowstring and thus faces the prospect of shaming himself and his rugged father in front of the community’s burly, beardy menfolk. Watch Big Game with a straight face and it’s ridiculous; view it as tongue-in-cheek (and Rare Exports proved that Helander has a wicked sense of humour) and, if not sublime, it’s certainly entertaining. At its best, there’s a Spielbergian wonder to its images, the forest hunched silently under a star-spangled sky, shafts of light prodding through the canopy. But in-between the set-pieces, Big Game lacks zip. It’s laudable that Helander takes frequent time-outs to hang with his characters and develop his themes (masculinity, fathers and sons, private vs public power) but the movie’s at its strongest when it’s fun, silly and OTT. Regular cutaways to Pentagon folk (Felicity Huffman, Jim Broadbent, Ted Levine) orchestrating a rescue strategy only halt the momentum, while the two main bads, Ray Stevenson’s miffed Secret Service agent and “over-privileged psychopath” Hazar (Mehmet Kurtulus), are cut from cardboard. Still, it’s good to see Jackson lose his cool. Usually so charismatic and capable, he here plays a pampered wimp who can barely tie his own shoelaces... until he learns to spray bullets and mouth ‘muthafucker’, that is.